Deep Space Gateway Educational Utilization Call for Ideas! Do you have ideas on how the next generation of space station can be utilised for the education of students? Send us your ideas for the educational use of the future Deep Space Gateway human outpost. 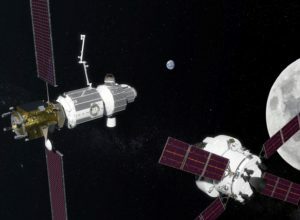 The Deep Space Gateway is planned to be humanity’s first spaceship, a crewed platform in deep space, and the ESA Education office wants your inputs into how it may be utilised for educational purposes! While the primary purpose of the Deep Space Gateway (DSG) is for Human Space Flight and exploration, the developing partners (ESA, NASA, Roscomos, JAXA and CSA) recognise the excellent opportunities for additional scientific research and for education. The ESA Education office has a unique opportunity to provide inputs in this early phase, and we are consulting with you, the educational community, to specify how this new space platform might be used for education.